A tasty salad with a bit of bite. 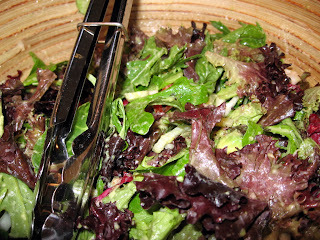 The salad itself contained baby cucumbers, avocado, onion and mixed greens. The recipe for the dressing is below. Peel the ginger with a spoon, then grate it with a microplane. Whisk the grated ginger with the rest of the ingredients. 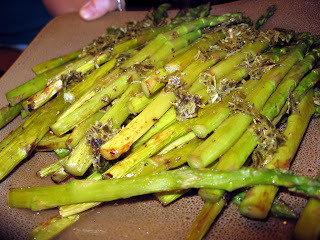 Season the asparagus with salt and pepper and roast on a cookie sheet on 400 until tender. Mix the mint, lemon juice and olive oil and spoon it over the asparagus. 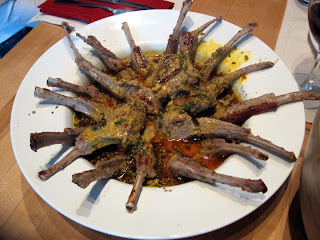 These delicious lamb chops are derived from Vij's Cookbook of the great Vij's restaurant in Vancouver, BC. Even though I always end up breaking the sauce, they always taste delicious. 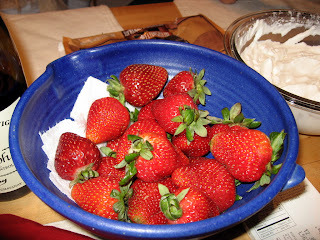 In season strawberries are so good. 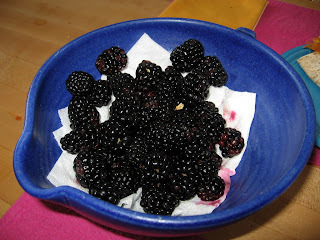 It makes you want to remember in winter, not to eat them, for they'll be that much better if you wait until summer again. 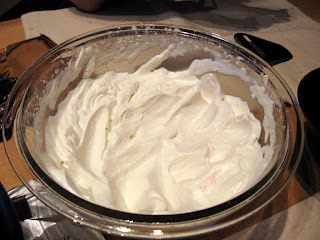 A few tb whisky beaten with cream, vanilla and Splenda. 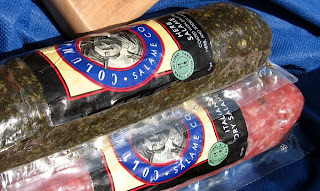 Fresh sage adds a nice twist to our standard breakfast. We've been wanting to go to A16 (named after and Italian highway) for a long time. Unfortunately, we always think to go there at about 7 on a Friday night and, of course, they never have any tables available at such late notice. This time we thought about it on a Wednesday, and when we called, all they had for Friday was 5:30 or 10:30. We decided to take the 5:30, even though that's about 3 hours before we usually eat dinner, since we had a party to attend later that night. When we walked in we were pleasantly surprised to find the restaurants decor to be soft and muted, in tans and browns, but hardly rustic. It was very un-Marina-y, which we appreciated, casual, friendly and sophisticated rather than see-and-be seen. 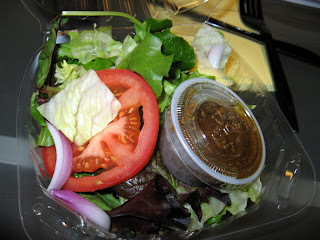 The food was delicious, for the most part, with a couple of dishes that really stood out. If we can say one thing about the chef, it's that he REALLY loves olive oil, in a good way. And the service was great too. The waitress was knowledgeable and friendly, and happily answered our myriad questions about the menu. She even sent us some little glasses of a beautiful dessert wine on the house. All in all, A16 certainly lived up to the hype and we are excited to taste the chef's food again at the Rising Stars Revue next Tuesday. 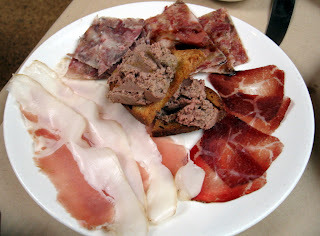 We wanted to try all of the house-cured salumi, so our waitress kindly offered to put together a sampler for us. 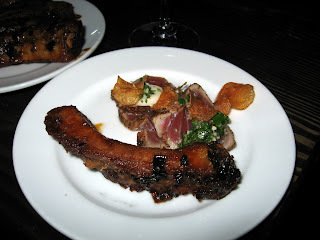 This plate included: bresaola, lonza, ciccioli, coppa di testa (head cheese), and a pork terrine. All were very good, although the bresaola was a bit salty. This was so good. Words can not even express it. 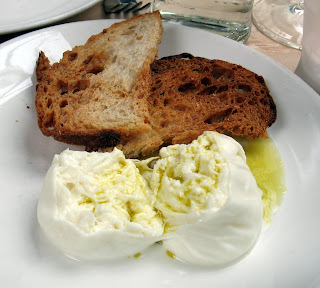 This was the best mozzerella we have ever had, hands down. 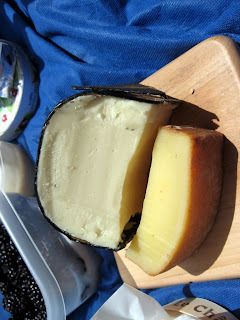 It was soft, almost spreadable, and so flavorful. 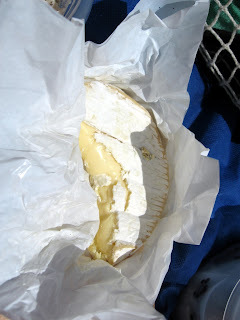 I'd like to say that I'm never going to eat supermarket mozzerella again, but that isn't entirely true and I know it. 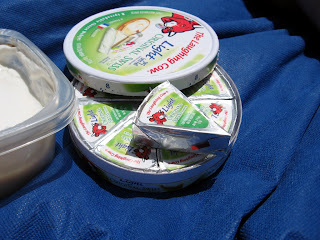 Rather, every time we eat mozzerella it is simply pale in comparison to this. 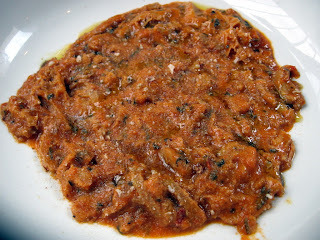 Cooked with onions, tomato and white wine, this tripe was flavorful and tender in a way that was utterly surprising. 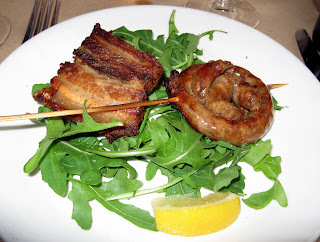 Alexis, who usually hates tripe, was eating this by the forkful. How the chef gets the tripe so tender, I have no idea. It's always nice when you get a list of sides to choose from with your entree. Then you can make your decision based on the protein rather than having to worry about the potatos that are coming that you are not going to eat. 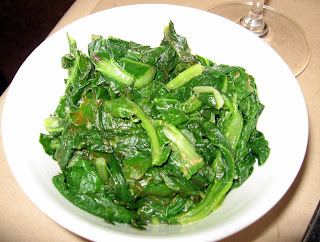 In any case, this chard was tender and not bitter at all. 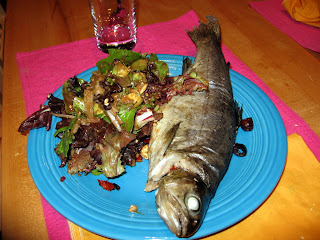 The only complaint was that it was a little too heavy on the lemon and the flavor of the anchovy was lost. The simplicity of this dish was what set it apart. 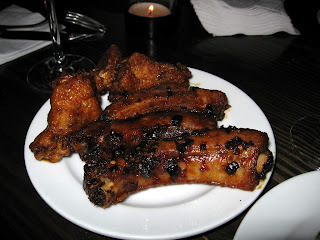 The sausage was tender and juicy and the rib (sans bone) was tasty, but very fatty. Wow. 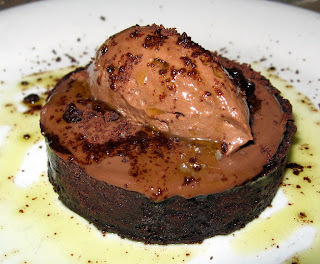 Gooey, intensly chocolatey and bursting with flavor every time you bite into the crunchy sea salt. 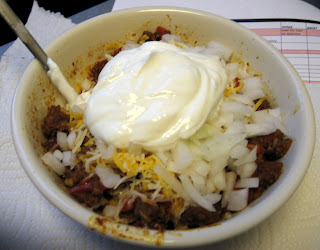 For whatever reason, Giao's usually stellar chili was a bit lacking in the depth of flavor department. 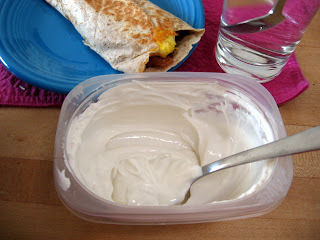 Still, topped with cheese, onions and Greek yogurt, this was a tasty lunch. Will we ever get sick of this? I don't think so. 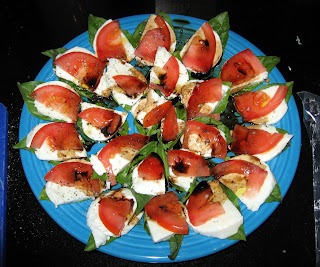 Fresh basil, fresh tomato and fresh mozzerella layered on a plate, then drizzeled with olive oil and balsamic vinegar and seasoned with sea salt and pepper. Perfect little bites that explode with flavor in your mouth. We got home rather late and Alexis had thawed some chicken breasts intending to make Chicken Divan. However, we were missing some key ingredients and the stores were closed, so she decided to make something else that was composed of chicken and brocolli. Sautee the garlic in a bit of olive oil until just beginning to color. Place the seasoned chicken breasts on top of the garlic in the pan and cover. 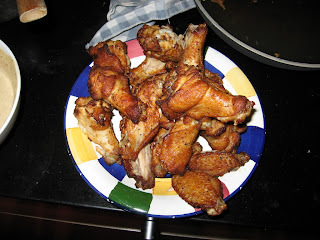 Cook for a few minutes, then flip the chicken. Cook until tender. 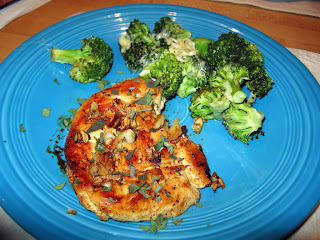 Sprinkle the sage and the lemon juice over the breasts just before serving. Click here for the recipe for roasted cheesy brocolli. Alexis asked for no mayo, Giao asked for no ketchup, we got 2 burgers, one with no condiments and one will all condiments. So something got lost in translation. 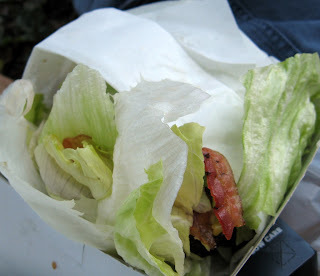 Still, this has to be the best fast food burger around. Carl's is about as far as we like to sink on the fast food chain, and only every once and a while. 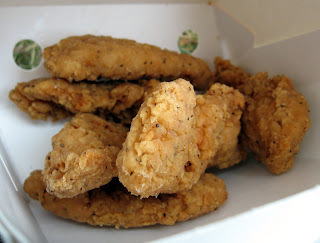 Despite the thick breading we attempt to pick off, these tenders are made from real, not reconstituted chicken. When Alexis lived in New York her favorite breakfast was a bacon, egg and cheese on a toasted roll, dipped in ketchup. 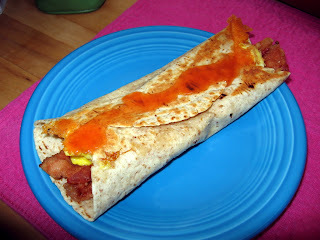 This breakfast burrito satisfies that hole in her stomach in a healthier way, with a low carb tortilla full of fiber instead of a roll and hot sauce instead of high-fructose-corn-syrup laden ketchup. 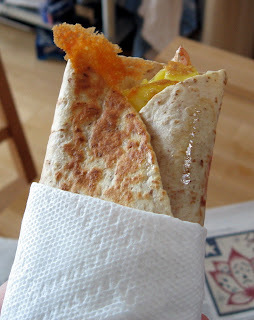 It's been a while since we've made one of these, and sometimes you forget just how good fried cheese can be. 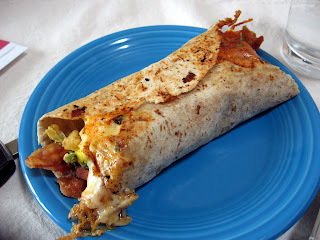 This particular version of a chupaqueso makes a great meal at breakfast, lunch or dinner and takes only about 10 minutes to make. 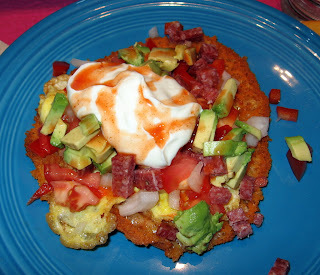 This chupaqueso was topped with a fried egg, tomato, avocado, salami, , onion, greek yogurt and hot sauce. 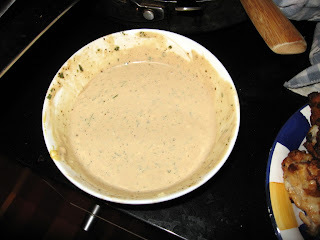 Click here for a video demo on how to make a chupaqueso. Today this seemed like an extra large potion, with more cheese than usual. Alexis was very full when she finished. 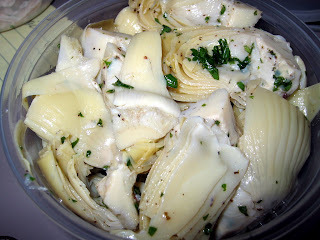 A pretty nice little side salad with a real vinegarette and a marinated artichoke heart. Giao ate at Gambino's today as well. 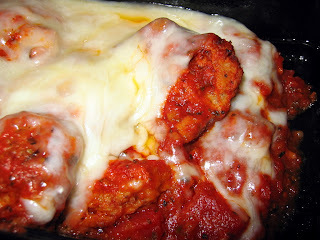 Big, tasty meatballs smothered in sauce and cheese. 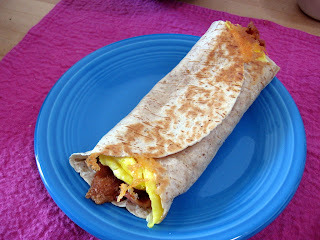 Full of protein and fiber and easy to take on the go if you are running late. A very healthy, super-quick weeknight meal. Chop the olives and tomatos finely and mix together. Season the inside of the trout with salt and pepper, and stuff 1/2 the tomato-olive mixture into each fish. Place the fish in a large baking dish and bake on 400 for about 10 minutes, or until the flesh flakes. 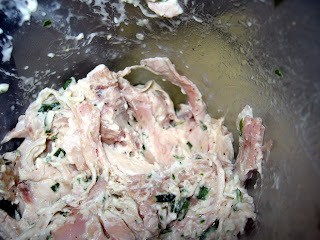 Giao ate Tarragon Chicken Salad. From Costco. 20 minutes from the freezer to your mouth. 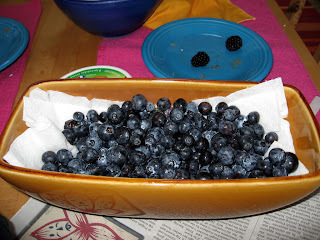 For the recipe, click here, then subtract the blue cheese. We went to a fundraiser for an organization called Clementina Cares, whose mission, as we understand it, is to make our neighborhood clean, safe and beautiful. The ribs were fall-off-the-bone tender, and the tuna wasn't bad either. Ditto on the ribs. The wings were a bit salty though. 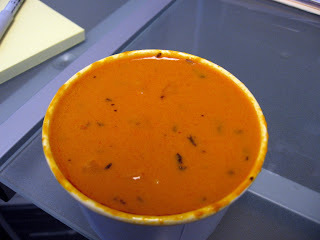 Creamy, thick, smooth, and bit spicy. Very good. The ingredients are certainly fresh, but the rotisserie chicken was a bit dry. 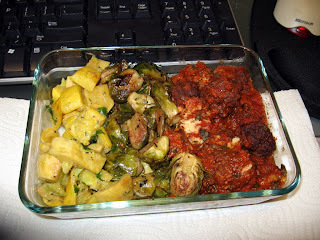 Giao had leftover meatballs and squash. Very tasty. Not too mayo-y and very herby. In honor of the Sopranos finale, we prepared an Italian feast. 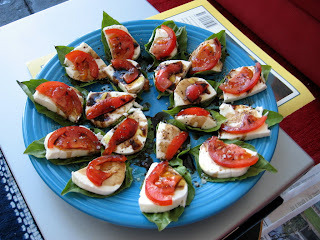 Fresh basil, fresh tomatos, fresh mozzerella sprinkled with sea salt and pepper and spritzed with olive oil and balsamic vinegar. 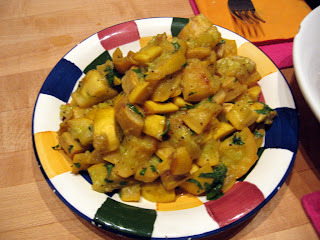 This squash was simply chopped and sauteed in a bit of olive oil until tender and seasoned with salt and pepper. Super easy. Chopped fresh cilantro was thown in at the last minute. Very Italian, and very fresh, yet hearty. We still had some frozen, raw meatballs leftover from when Alexis made far too many for a dinner party. 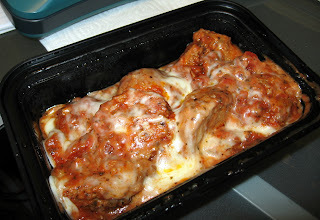 Click here for the recipe for the meatballs. To cook them, sautee in a large shallow pan in a few TB of vegetable oil, moving the meatballs frequently. 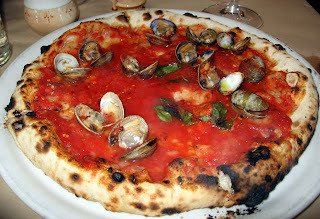 For the recipe for the homemade tomato sauce, click here. 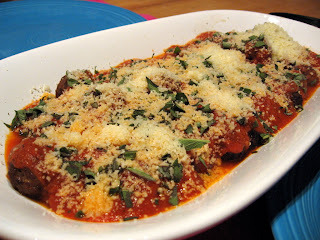 The drained meatballs were placed in a dish, we poured the sauce over it, and then sprinkled with a lot of fresh chopped sage and grated parmasean. 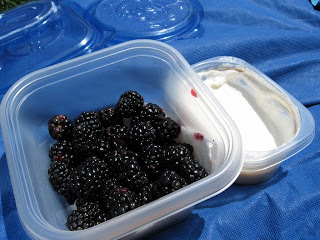 It was the first nice day in a while and so we had to have a picnic. 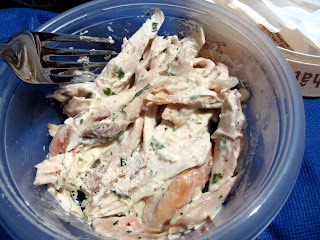 One of the best renditions of chicken salad we've made recently, and one of the simplest.